Provides an overview of the most significant issues and debates in Gothic studies. Explains the origins and development of the term Gothic. 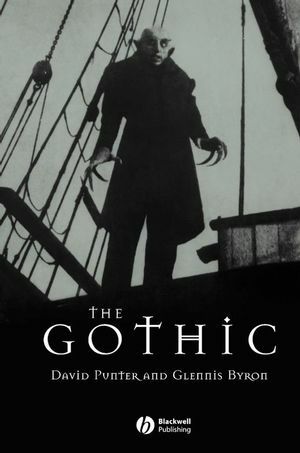 Explores the evolution of the Gothic in both literary and non-literary forms, including art, architecture and film. Features authoritative readings of key works, ranging from Horace Walpole’s The Castle of Otranto to Bret Easton Ellis’s American Psycho. Considers recurrent concerns of the Gothic such as persecution and paranoia, key motifs such as the haunted castle, and figures such as the vampire and the monster. Includes a chronology of key Gothic texts, including fiction and film from the 1760s to the present day, and a comprehensive bibliography. David Punter is Professor of English at the University of Bristol. He has previously taught at the Chinese University of Hong Kong and at Fudan University in Shanghai, among other institutions. His recent publications include Postcolonial Imaginings (2000), Writing the Passions (2000), Gothic Pathologies (1998), and The Literature of Terror (2 vols., 1996). He has also published four volumes of poetry.Glennis Byron is Reader in English Studies at the University of Stirling. She has also taught at the University of Alberta in Canada. Her previous publications include Dramatic Monologue (2003), Letitia Landon: The Woman Behind L.E.L (1995), and Elizabeth Barrett Browning and the Poetry of Love (1989). Gothic in the Eighteenth Century. Science, Industry and the Gothic. Gothic and the Graphic Novel. Charlotte Brontë (1816-1855) and Emily Brontë (1818-1848). Walter de la Mare (1873-1956). E. T. A. Hoffmann (1776-1822). G. P. R. James (1799-1860). J. Sheridan Le Fanu (1814-1873). G. W. M. Reynolds (1814-1879). Horace Walpole, The Castle of Otranto (1764). Ann Radcliffe, The Mysteries of Udolpho (1794). William Godwin, Caleb Williams (1794). M. G. Lewis, The Monk (1796). Mary Shelley, Frankenstein (1818, revised 1831). C. R. Maturin, Melmoth the Wanderer (1820). James Hogg, The Private Memoirs and Confessions of a Justified Sinner (1824). Emily Brontë, Wuthering Heights (1847). Wilkie Collins, The Woman in White (1860). Sheridan Le Fanu, Uncle Silas (1864). Henry James, The Turn of the Screw (1898). Anne Rice, Interview with the Vampire (1976). Stephen King, The Shining (1977). Bret Easton Ellis, American Psycho (1991).